A startup real-estate technology firm is looking to take on shared office company WeWork Cos in one of hottest new areas of commercial real estate: providing short-term office space to some of the biggest U.S. companies. Convene launched nine years ago as a firm that provided conference, meeting and training spaces. Now it is starting to provide short-term, more flexible workspaces as well. The New York-based company sets up ventures with landlords or leases out big spaces itself wholesale, then carves them up and rents them out to businesses. Many corporate tenants today want to be able to scale up or trim down quickly. That means leasing a portion of their space for only a few years or even a month—making traditional leases of 10 or 15 years that landlords have offered for decades less attractive. This fast-growing corner of the commercial real-estate market is shaking up the often-staid business of office rentals by shifting some of the power to newer, more nimble firms. Convene, WeWork and others are developing relationships with companies that used to go directly to landlords. Some landlords are trying to block this by offering flexible workspaces themselves, posing a threat to Convene and others. But many building owners are finding that they can’t do it as well as the startups who devote themselves to these businesses. “The largest asset class in the world is being disrupted,” said Ryan Simonetti, Convene’s co-founder and chief executive, referring to the office market. The so-called flexible space could account for as much as 30% of office space demand by 2030, up from less than 5%, according to real-estate services firm JLL. Convene recently closed a $152 million funding round, part of which will help this new campaign. That increased its equity raised to $260 million, including investments from traditional office landlords like the Durst Organization, RXR Realty and Brookfield Property Partners. Other companies in the flexible office sector include Knotel, which closed on a $70 million funding round earlier this year, and Industrious. The five-year- old firm has locations in about 50 locations in 27 cities. “The name of the game is convincing companies they should be outsourcing their workplace needs to third-party providers,” said Jamie Hodari, chief executive and co-founder of Industrious. 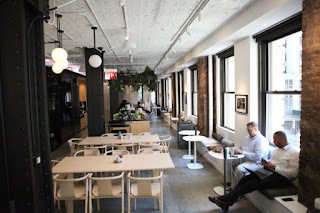 WeWork’s tenants include International Business Machines Corp. , Microsoft Corp. and UBS Group AG. Industrious rents out to companies like Pfizer Inc., Hyatt Hotels Corp. , Pandora Media Inc. and Freddie Mac. Convene currently has operations in 19 buildings in five cities and expects to open four more by the end of 2018. Big-name tenants who are meeting some of their space needs through Convene include Hartford Insurance, accounting firm EY and Comcast Corp.
“You talk to any company today and they would like to make as many of their expenses as variable as possible,” said Mr. Simonetti. The company opened its first three workspace locations this year. Their amenities include a range of lounges and meeting rooms, food and drink and apps for workers that enable them to book rooms, order food or hear about building events. This year Convene is expecting about $80 million in revenue. Many of Convene’s landlord investors have either opened Convene facilities or are considering doing so. Brookfield expects that as much as 10% of its portfolio eventually might be flexible space run by operators like Convene, according to Ric Clark, chairman of Brookfield Property Group. For traditional landlords, the trend offers a short-term payoff but a longer-term risk. Firms like Convene and WeWork have become big tenants, helping boost revenue. But the shorter, flexible leases that tenants increasingly prefer make it trickier for owners to finance buildings because long-term cash flow is less assured. “You have a riskier profile for an office building,” said Danny Ismail, analyst with Green Street Advisors. There are also plenty of risks for firms like Convene and WeWork. For starters, demand for their space has yet to be tested by an economic downturn. Convene said it is trying to work closely with landlords, not pose as a threat to them.